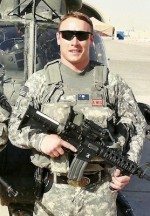 Show your spirit and remember Murph this Memorial Day. The shirts are high grade American Apparel and built to last. 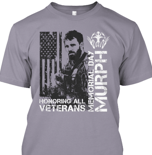 You can buy the Murph Hero WOD Tshirt Here from Teespring. A portion of the proceeds will go to Navy SEAL Foundation. Hello sir, my name is Eli Ostrow, and I’m excited to say this was my first sealgrinderpt workout! Thank you Mr. McLeod for make this information available. I’m excited for the challenge! I was able to do 2 rounds. I substituted the muscle-ups with dips and pull-ups. Welcome to SGPT Eli — Push forward and grow 1% daily! the weeks challenge 50x flutter kicks. Completed 3rounds plus 800m run, 80 squats, 8 ring dips, and 8 pushups. Fell just short of my last time of 4rds. Cool down with 50 – 4 count flutter kicks 2:08. Done 4 rnds. 50 4count flutter kick challenge. Bi’s & tri’s super sets. 4 rounds 40# vest. 5 mile Ruck after. 50 4 count flutter kicks completed in 2:08 min. Completed 5 rounds / 600m on rd 6. 100 4 count flutter kicks, 100 pushups, 100 bicep curls, 100 tricep extensions and 100 floor wipers. I took today as an active rest day, and did the daily challenge, in addition to going for a long walk with family. Performed 75 consecutive 4-count flutter kicks. 6 complete rounds, split up muscle ups because i have no place to do them. Completed 3 rounds of Hortman. Subbed for muscle ups as rx. Also made a daily calender note to listen to SGPT audio every morning. Great email Brad! 700 meter swim in the morning (pool opened late), Hortman 2.3 rounds (800 meters, 80 squats, 3 dips, 3 push ups, and 3 pull ups per round). Completed third round after end of 45 minute time. Completed 50 4 count flutter kicks. Four total rounds completed. Can’t do muscle ups, so subbed with burpee pullups.